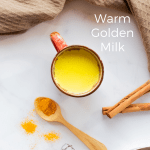 Preparing golden milk is very easy and it will only take a few minutes. You simply have to warm up the milk (animal or plant-based), and then add the spices and sweetener. 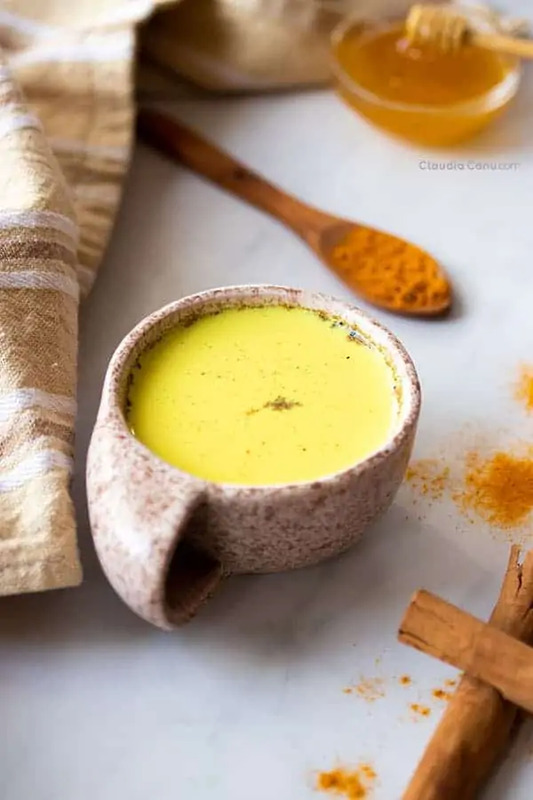 In this recipe, apart from the main ingredients of turmeric and black pepper, I added cinnamon and ginger powder, but you can experiment with the spices you prefer. Cinnamon gives it a sweet touch, only requiring half a spoonful of honey to make it sweet. If you have access to fresh turmeric, you can use it instead of the powder version. Personally, I haven’t tried it yet, but from what I have read, it’s easy to use and you just have to boil it along with the milk for about 3 minutes. 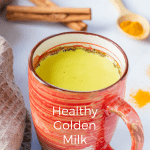 ¿Why do I consider golden milk healthy? Due to several factors, we continue to discover that more and more people are lactose intolerant. This, and other reasons, have led to the theory that humans should not continue to drink milk once they are adults. In addition, because of the growth of industrial farming and the mistreatment of animals on them, milk has come to be seen as one of the foods that must be excluded from our diet if we want to eat healthy. 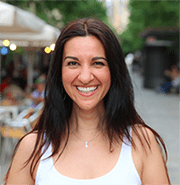 However, my point of view is that, to maintain a healthy and balanced diet, we should not exclude natural foods if we don’t have any intolerance for them. What we must do is learn to buy the right foods and always eat a wide variety of them. Whole cow’s milk contains significant amounts of minerals and vitamins, as well as protein and the healthy fat that allows the absorption of fat-soluble vitamins, such as vitamin A. Personally, I am lucky not to have any lactose intolerance and, since I started studying the Master’s Degree in Nutrition, I have reintroduced milk into my diet, BUT in limited quantities, always organic and possibly from grass-fed cows. I alternate the consumption of cow’s milk with plant-based milk and, when I have the opportunity, also with goat’s milk. This is because my priority is to have a varied diet in order to get all of the nutrients that my body needs daily. 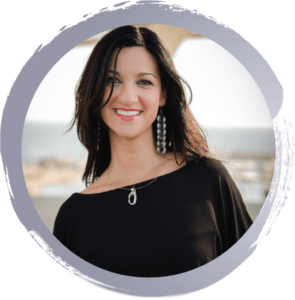 I think that each of us should experiment with food to understand how our body works and what it asks for. If you can drink milk and you like it, I don’t think that you should exclude it from your diet. What is important, though, is to always read the labels, both the list of ingredients and the product’s origin. If you consume plant-based milk, it’s very important that you read the list of ingredients. Most plant-based milks sold in supermarkets contain added sugar. Even if you buy organic brands, it’s very likely that they contain sunflower oil and added salt. From what I have seen so far, one of the most natural vegetable milks is the oats milk that, depending on the brand, is usually made only with oats and water. Another option is that, with a good blender, you can prepare your plant-based milks at home. With a quick search on the internet, you will find a lot of recipes to make plant-based milks of various types. Turmeric is an intense, yellow-orange root from the South of Asia. It can be found fresh or in powder. Medicinally, it’s used mainly for its anti-inflammatory, antioxidant and anticancer properties. In my post for the roasted chickpeas, I wrote about turmeric and the reason why it must be consumed together with black pepper and fat so our body can absorb all its active ingredients. Ideally, once you have prepared the golden milk, you should consume it at once. What you can do is prepare the mix of spices and store them in a jar. Then when you feel like it, you simply have to warm up the milk and add the amount of the mixture that you prefer. How do I prepare this golden milk in a vegan version? 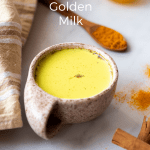 To prepare a vegan golden milk, you just need to use plant-based milk and your favorite sweetener instead of honey. 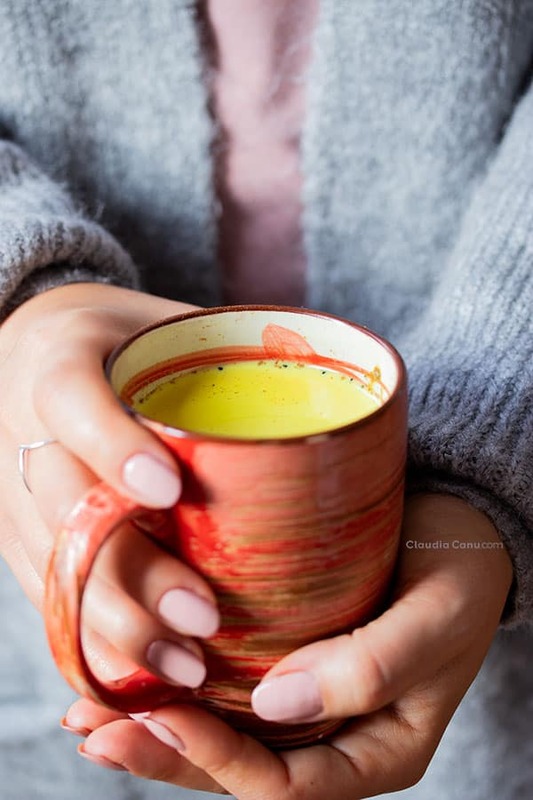 Golden milk is a comforting drink and can help you relax in times of stress, and even at work or at night when we are about to close the day by getting ready to go to bed. If you find the option of taking it to work interesting, all you have to do is bring with you the mix of spices so that you only need to warm up the milk and add the spices while at the office. 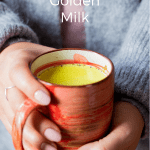 If you have insomnia, or you usually struggle to get a good night’s rest, you can try this golden milk about an hour before going to bed. Can I prepare the golden milk with other flavors? The first thing you can change to get different flavors is the milk you use. If you use plant-based milk, it’s important that you add some fat, such as coconut oil, so that your body can absorb the turmeric’s active ingredients. Sometimes, I also add cocoa powder and get a drink that looks more like hot chocolate, but has all of the properties of turmeric. Finally, you can play with the amount of spices to get the flavor you like the most. For example, if you really like ginger, you could add more of it, or even use fresh ginger. If you don’t like ginger, or you don’t have it at home, you could avoid using it. If you like a more spicy taste, you could add more pepper or even chili powder. As I always say, adapt the recipes to your palate and consume foods with the flavors that you like the most. Could use some of this golden milk in my life! All the ingredients scream healthy and delish! This sounds like a really comforting drink, especially for the cold weather. We actually drink raw milk and I bet it would make an amazing golden milk. I also have raw turmeric, so I’ll use that. I didn’t realize it was this easy to make golden milk! 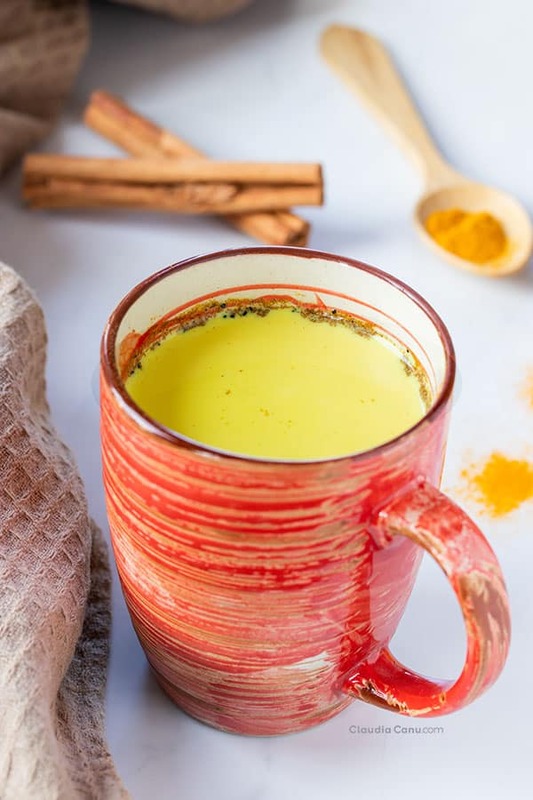 I like using turmeric in cooking and keep meaning to try golden milk but have never quite got round to it – your pictures look so pretty and I like the idea of a bit of cinnamon in there too. Must finally try it! Give it a try, Caroline, I’m sure you’ll love it! This recipe is so easy! 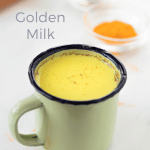 I have never tried golden milk. but I love the spice combination you have going on here. I have been lactose intolerant, in varying degrees, for over 30 years! I can not tolerate milk, or soft cheeses, but do ok with hard cheeses. I’ll have to try this recipe, with one of my milks.